I am so glad to be here sharing sewing projects with you again! 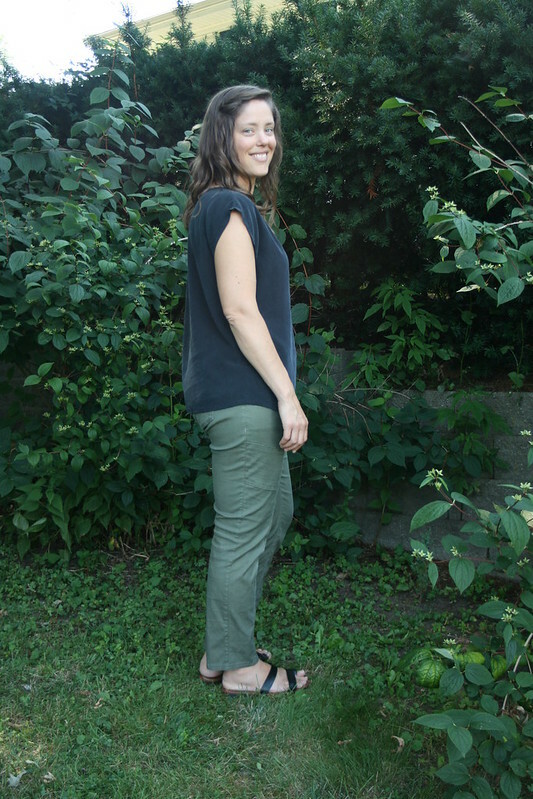 It feels like it’s been forever since I published a sewing project post! Today’s was almost without photos of the garment in action, because I couldn’t find the pictures I had taken of the shirt while I was wearing it. Oh, blog photography! It’s definitely the most challenging part of blogging for me. 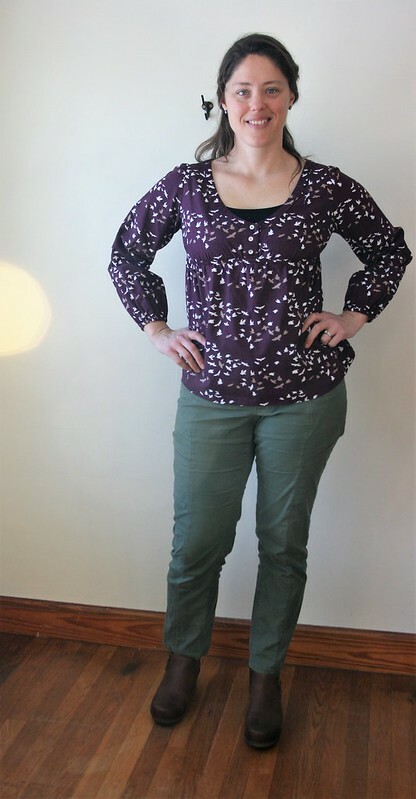 Today I want to talk about Simplicity 4111, a pattern that is out of print but, I would argue, still in style. 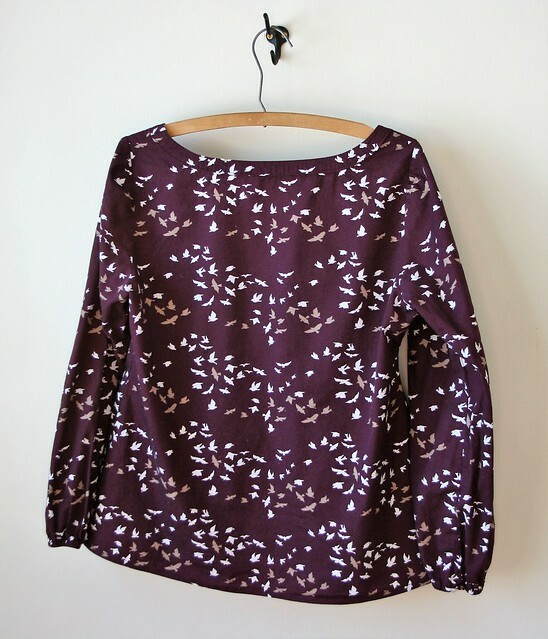 This pattern is a Built by Wendy pattern (although the line is technically called “Built by You”), a collaboration between designer Wendy Mullin and Simplicity. I’ve had this pattern for ages, since before I started sewing regularly, but haven’t made it until now. 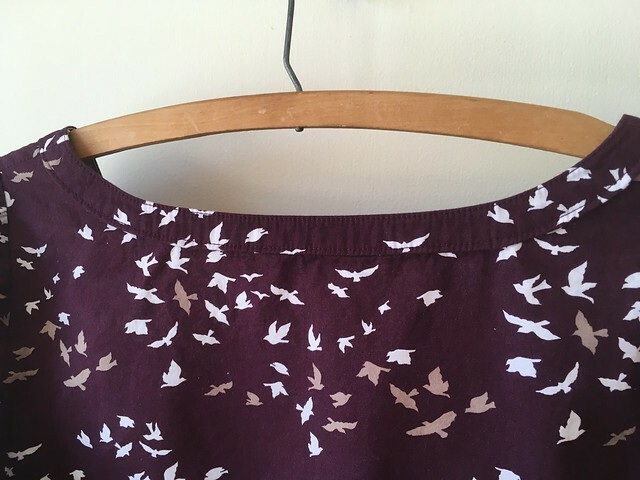 I paired it with a fabric I’ve also had for some time: “Aves Chatter Dim” from the “Winged” collection by Bonnie Christine for Art Gallery Fabrics, bought a few years ago at The Material Girls in Dearborn, MI. Originally I planned to make a button up shirt with it (because most woven cotton fabric looks like it would make a good button up shirt to me, actually), but in the end, I think this was a better use for it. After measuring the flat pattern, I determined that I wouldn’t need a broad back adjustment. You can bet I was pretty thrilled, albeit skeptical about that. I cut a size 16 bust, 18 waist, and 20 hip, and chose to make View B with long sleeves. I wasn’t sure where the elastic that is supposed to sit under the bust would hit, but I decided to just go for it. It is so interesting that you can both love and not love how a pattern turns out. 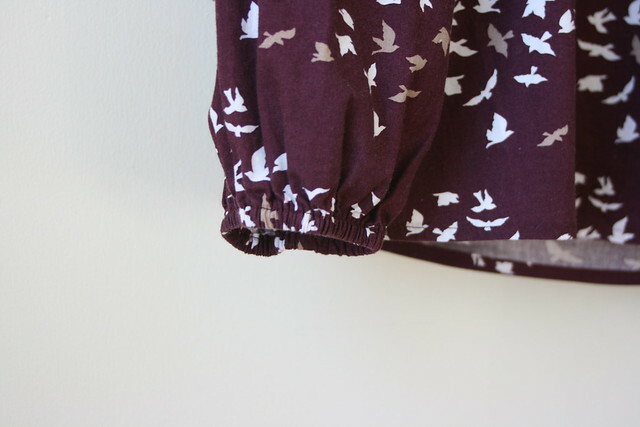 This shirt in this fabric is so, so beautiful to me. I love it. However…I really did need that broad back adjustment (next time!) and the under-bust elastic is a little high for me, giving the shirt a curious bust-minimizing effect. To be fair, this is the look on the pattern envelope, but I would prefer the elastic a little lower. 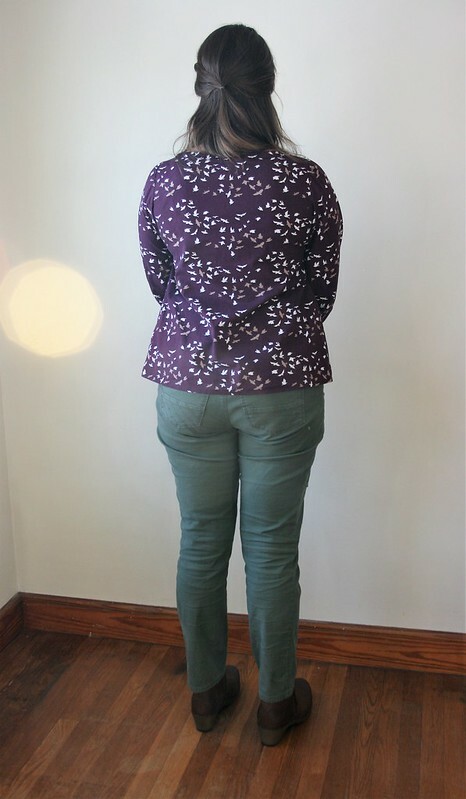 After running it by my friends at Sip & Stitch, this is what I think I need to adjust for next time: do my normal major broad back adjustment for comfort and lower the front elastic by an inch or so. Thanks (again!) to Stacy, who really knows her stuff when it comes to fitting and pattern drafting. Since we were talking about Built by Wendy, did you know she has four instructional sewing books? I currently have them checked out of the library. I just love flipping through craft and cook books. In case you want to check them out, too, they are: Sew U, Sew U Homestretch, Sew U Dresses, and Sew U Coats and Jackets. They each come with several patterns. You can also find them used at various spots online. Here’s a fun time-waster for you! The Akinator will guess any movie or literary character you can think of (although I have tricked him a few times!). Give it a try. It’s pretty amazing. Just make sure to check the “under 13” option if you are using the site with kids. Here’s a project I’ve been waiting to share with you for over a month!! I had debated blogging on the go last month, but decided against it. So today’s make has had a lot of real-world testing since I finished it. 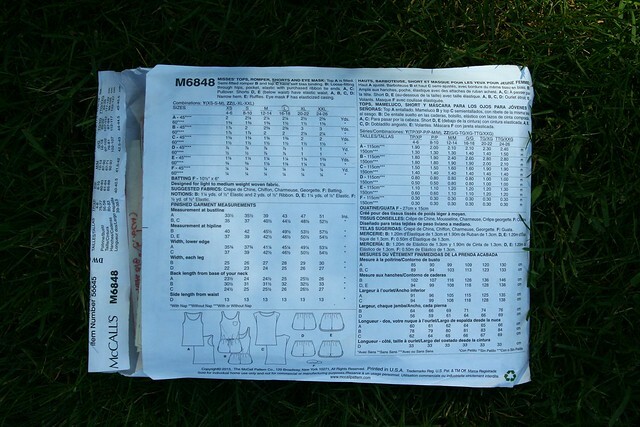 Long-time readers of this blog will remember my several versions of McCall’s 6848. 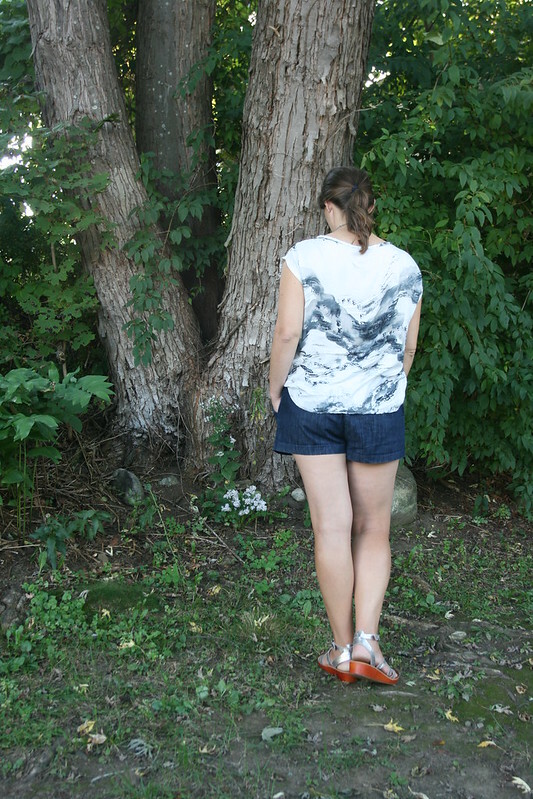 I’ve made the shorts, several racerback tanks in knits (#1 and #2), and the non-tank top. 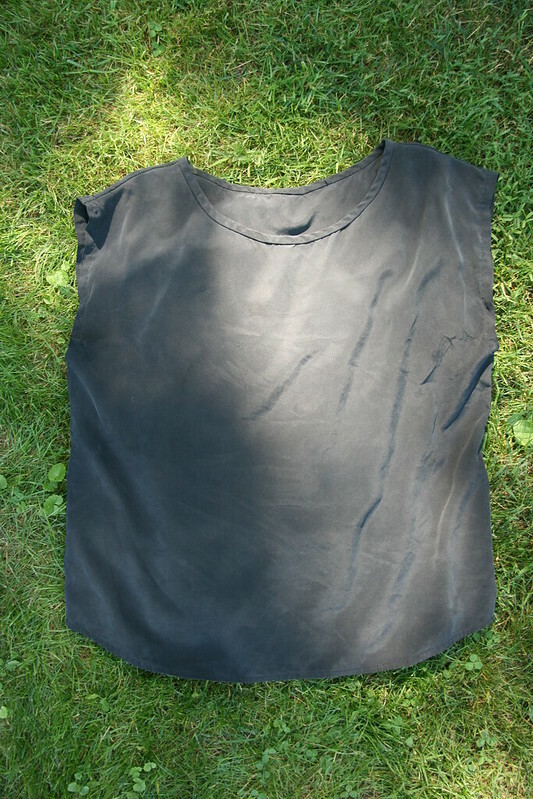 Here is yet one more knit racerback tank, this time tweaked out in a way that I can easily reproduce. 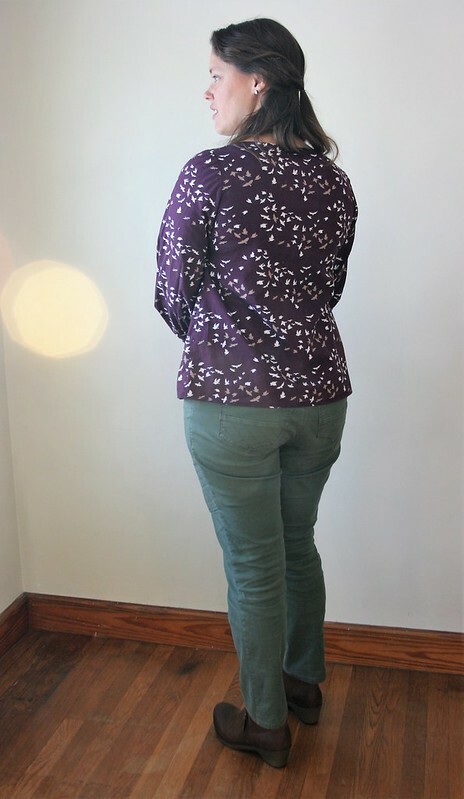 In my last version of this top, which you can see below, I realized that in order for this pattern, which is drafted for woven fabric, to work for knits, I needed to do a little tweaking. Now I can use the pattern pieces for knits or wovens depending on if I fold those little triangles down or not. The sizes of the triangles are the same as the wedges I took out of the shirt in the post on the gray exercise top I showed you above. The fit is terrific and, since this is a supposed to be a pajama pattern, there is the added benefit of being able to have the comfort of PJ’s in your everyday wear. You know I like that! I think I wore this outfit more than any other when I was in Michigan last month. I got the fabric at Joann’s. I think it is a polyester. 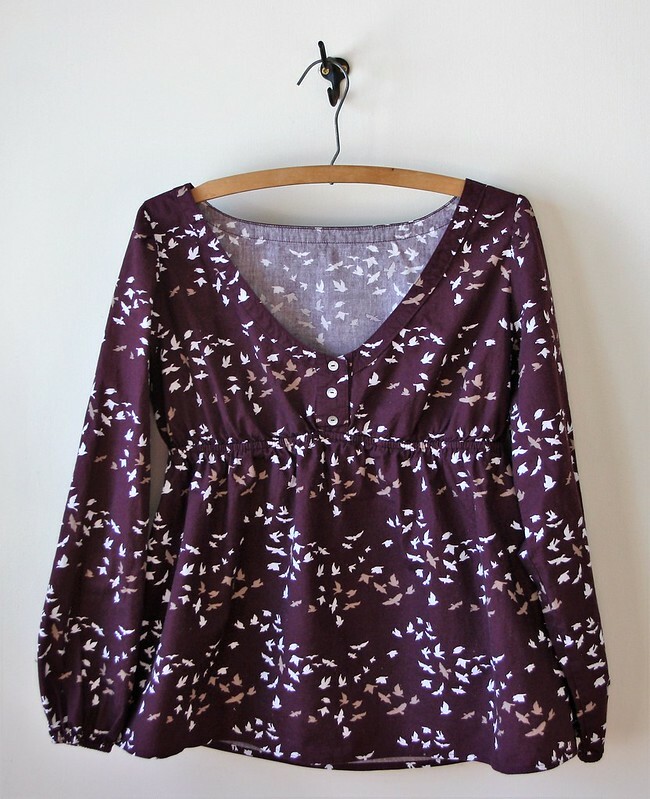 (You can see a fabric with a similar design but in a different colorway here. Looks like it’s a poly/rayon, so maybe that’s what mine is, too.) 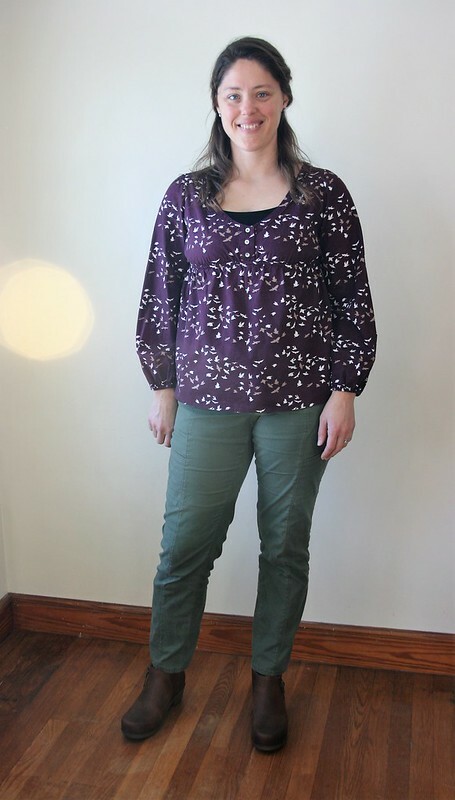 I’d had my eye on it for awhile because of the subtle print, but I was a little nervous because the last time I bought a polyester knit there (the fabric in these leggings), it pilled pretty badly after awhile. So, we’ll see if that happens. 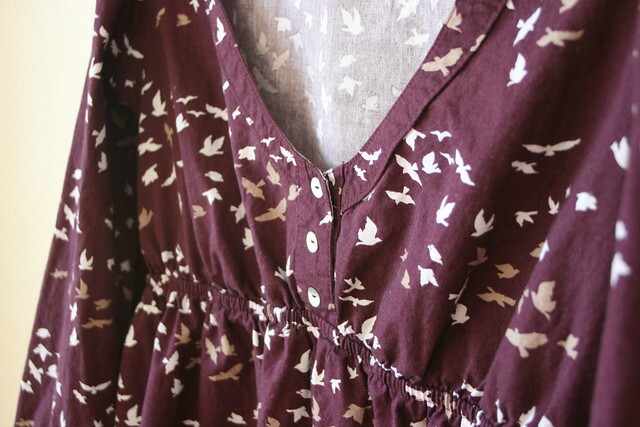 Also, the fabric is fairly transparent, so I lined it with some old, old white knit sheets I had around (also used as part of the lining in this dress). I almost never line things, so I was pretty proud of myself. I may or may not have sewn the armholes together before turning it right side out and, again, may or may not have had to rip those suckers out so I could turn everything right side out, but regardless of what might have happened, it got sorted out in the end. The lining hangs a bit below the cream side, but I decided I’m cool with that. I even made myself a little braided bracelet out of the scraps of sheet that I had lying around. I didn’t get any compliments (or even comments) on this, maybe because it looked stupid to people. I thought it was pretty cool, though, and it made me feel like I was enviro-saintly (yes, I just made that up–take note OED!) for using some scraps even thought I threw much bigger scraps away, but don’t think about that. Anyway, if you want to be cool like me (enviro-saintly, even), just take three strips of jersey from any old t-shirt or some knit sheets, stretch them out, braid them up, and tie some knots on either end. Then, knot them together and wear your bracelet like you paid an obscene amount for it at a cool store. In fact, if you make one, leave a link in the comments so I can see it! I’d like to see people put this with a festival look or just some kind of more-is-more thing and layer it up! 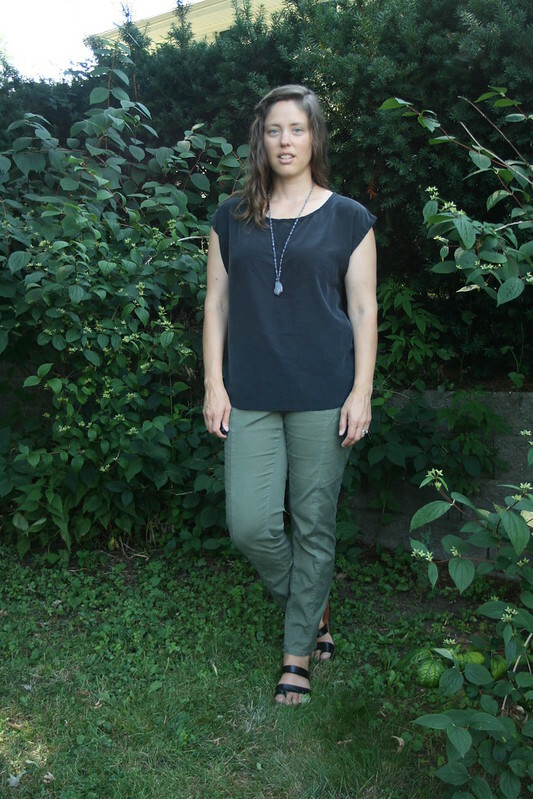 It feels like a long time since I had a sewing project to share with you, so I’m very happy to show you my finished version of Simplicity 1699 (top B). 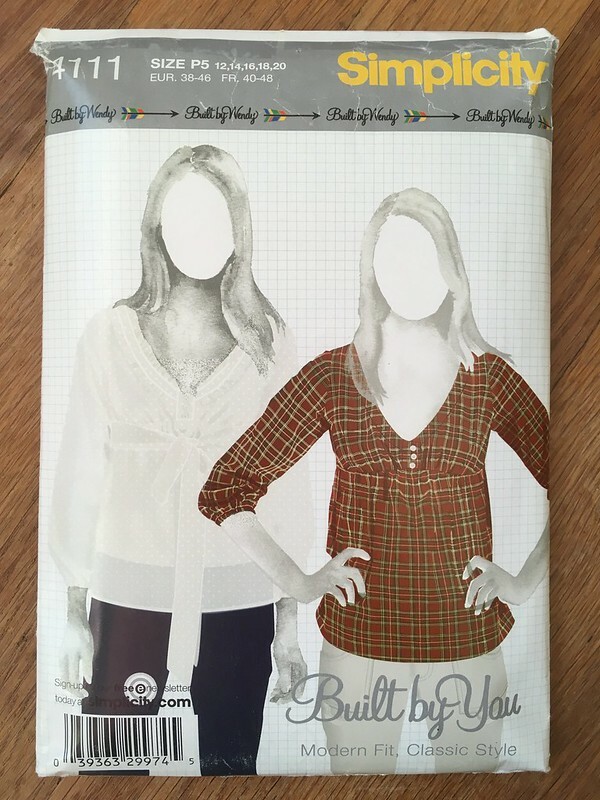 You may remember that I mentioned going to Pattern Review Day in Boston a few months ago. When I was there, we did a pattern swap, something I had never done before. 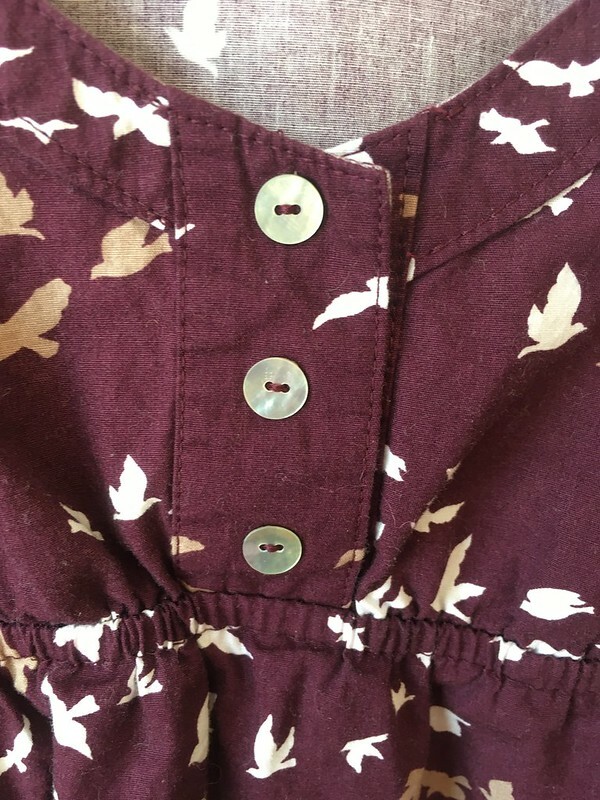 For this swap, you could bring up to five patterns to give, and take as many patterns as you brought. 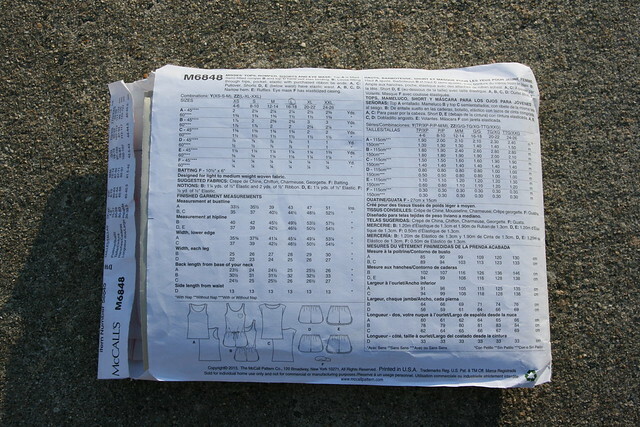 One of the patterns I brought home was Simplicity 1699. 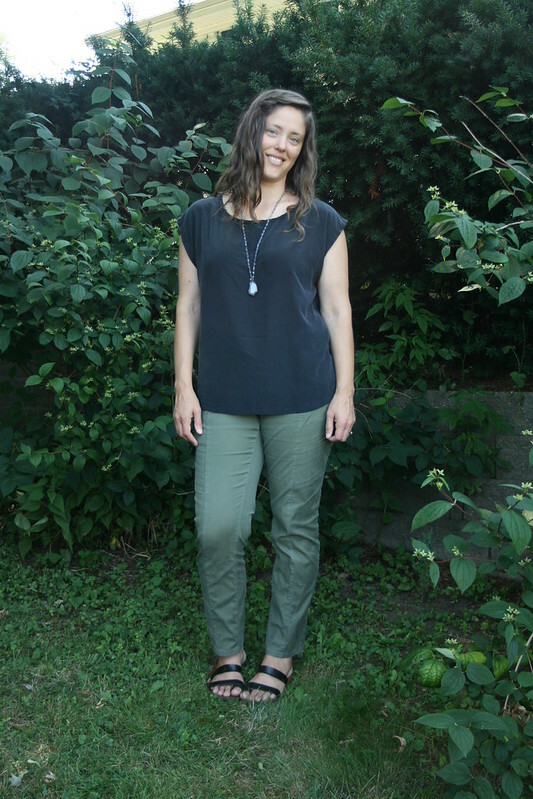 I needed a few tops that I could wear in settings that required something nicer than a t-shirt, like to church or baby showers or to work events for my husband, so I thought I would give Top B a try. 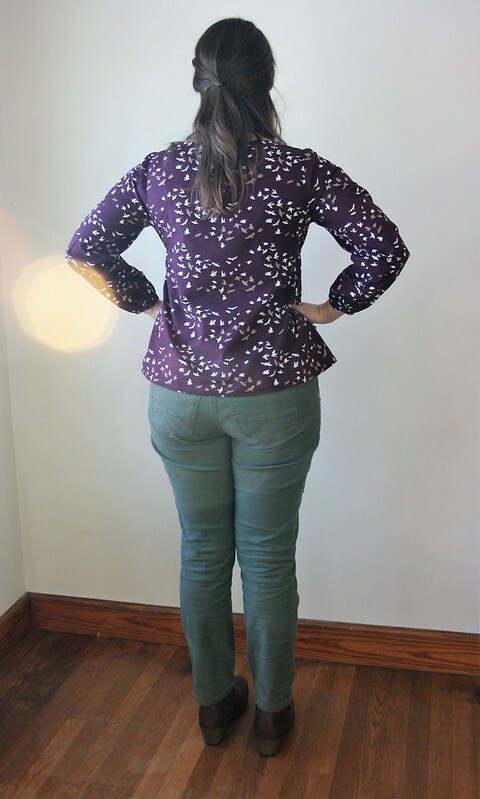 I didn’t have any peplum tops, so this seemed like a good opportunity to try one out. Oh, wait. That’s me. Well, I guess you should all make this shirt so you can be as happy as I am. 😉 Or maybe you just need a photographer as good at directing models as my husband is. He doesn’t even do this for his regular job, and look at these professional pictures. Yes, my life is perfect. OK. Let’s get serious. Here are the rest of the shots. My (slightly) more serious comments are that modeling things is not easy. Also, I have to smile in my pictures now. I can’t try to do the moody model look because my Grandma told me I should smile. And we should all listen to our grandmas (especially when they’re as awesome as mine). 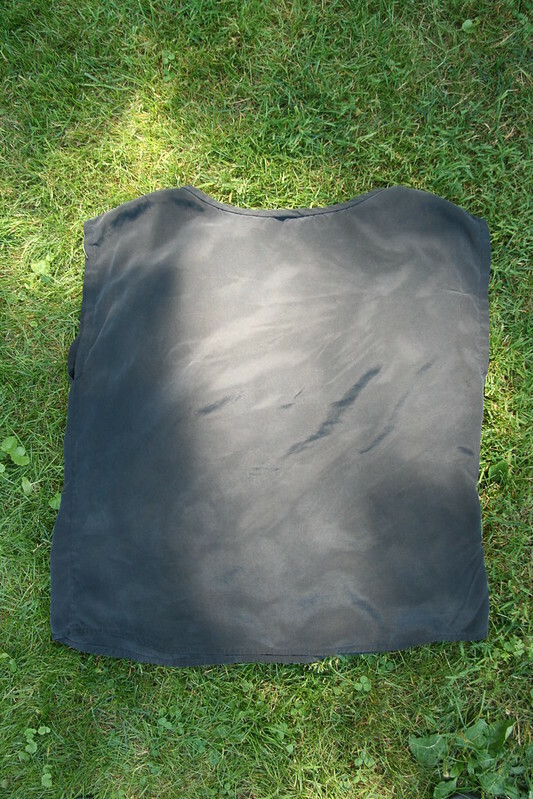 So…as I mentioned, I used the wax print I got several months ago for the body of the shirt. The fabric came in a six yard length, so I still have some left. Maybe I’ll make pants…I’m not sure. The collar is a brocade (I think–I’m still learning all the types of fabrics) that I got at an estate sale. I tried to sort of center the designs on the shirt front and on the collar. I don’t have much practice in this area, so I’m happy with how it turned out. The pattern was pretty easy to sew. Since I had trouble following the directions on my bathing suit, I used post-it flags (those rectangular post-its for marking pages) to help me keep my place. I used my bust measurement to choose my size, and hoped for the best. 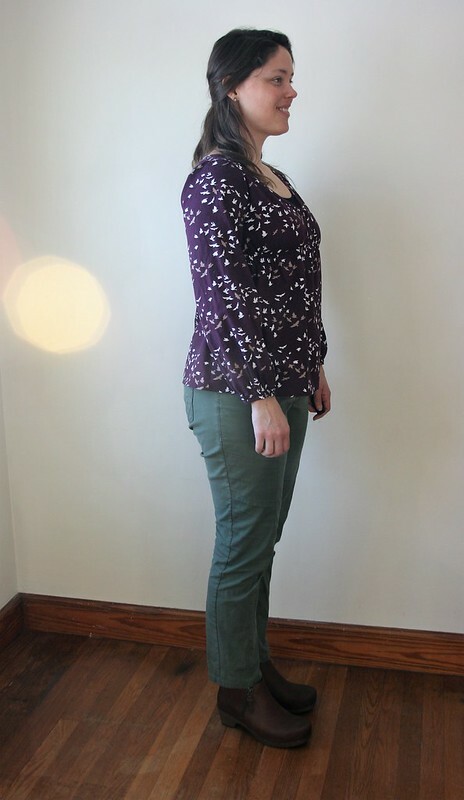 I am a larger size from the waist down, but thankfully there was enough ease in the pattern that it fits. Any smaller, though, and I would have had to let some seams out. 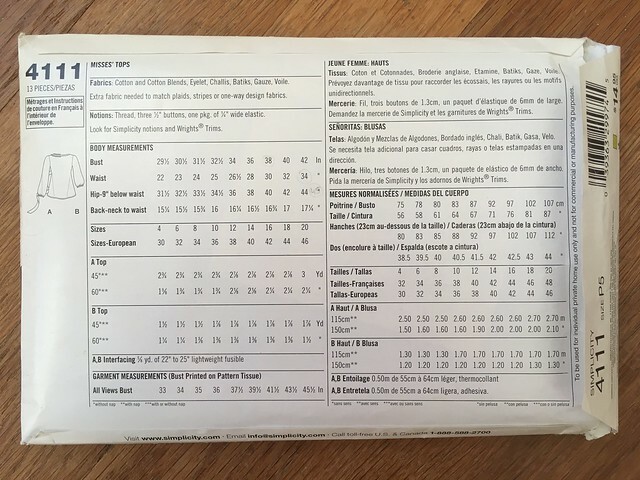 I’ve debated trying out the pants on the pattern envelope in this same fabric, but it’s not exactly a bottom-weight, so I don’t know how that would go. Any thoughts from sewers out there? 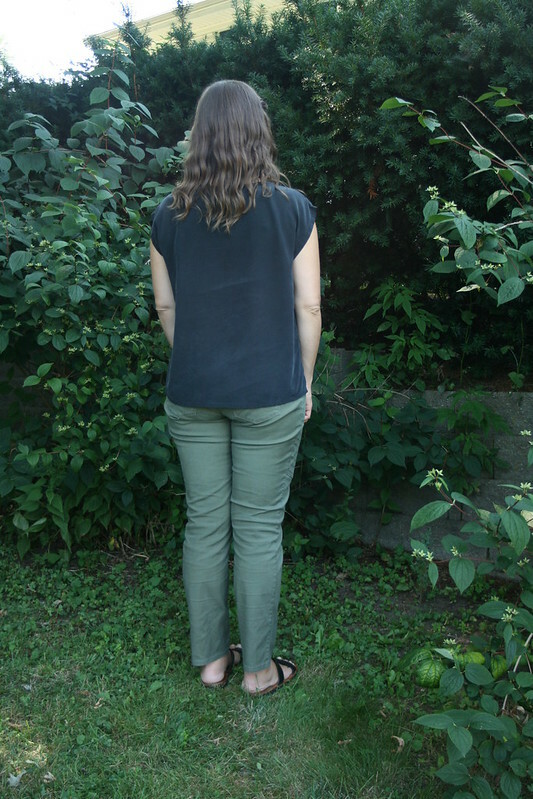 I looked in a book by Sandra Betzina and saw something about adding another layer of fabric in order to strengthen lighter weight fabric when making pants. Maybe I’ll try that. We’ll see. I have some other projects to delve into before I take that on. Final take on the shirt? It’s great. I like the style. I like the fit. The pattern was easy to follow. I’m going back now that I know it fits and zigzagging in the seam allowances so they won’t fray, and then I will consider it finished!